April 21, 2017 – A new observation from NASA’s Mars Reconnaissance Orbiter (MRO) captures the landing platform that the rover Opportunity left behind in Eagle Crater more than 13 years and 27 miles (or 44 kilometers) ago. A series of bounces and tumbles after initial touchdown plunked the airbag-cushioned lander into the crater, a mere 72 feet (22 meters) across, on January 25, 2004, Universal Time (January 24, PST). The scene includes Eagle Crater and Opportunity’s nearby parachute and backshell, from the April 10, 2017, observation by MRO’s High Resolution Imaging Science Experiment (HiRISE) camera. This is the first view from HiRISE of the Eagle Crater scene. Mars Reconnaissance Orbiter began orbiting Mars more than two years after Opportunity’s landing. 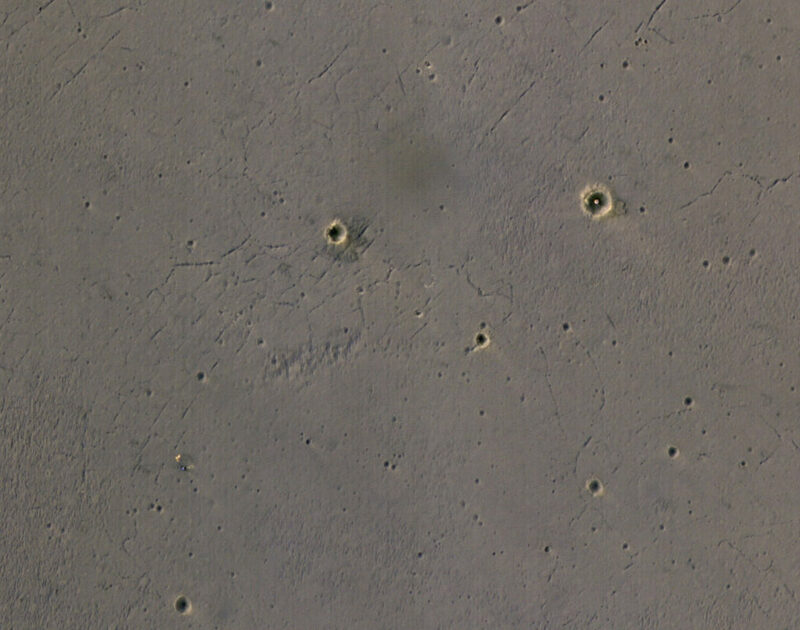 One of the first images from HiRISE in 2006 showed Opportunity at the rim of a much larger crater, Victoria, nearly 4 miles (about 6 kilometers) south of the landing site. Eagle Crater is at the upper right of the new image. The lander platform’s job was finished once the rover rolled off it. The parachute and backshell are at the lower left. The smattering of small craters on a broad plain is a reminder of the amazement expressed in 2004 about Opportunity achieving a “hole-in-one” landing. When the lander’s petals opened and Opportunity sent home its first look at its surroundings, it provided the first-ever close-by view of sedimentary rocks on Mars, in Eagle’s rim. After leaving the lander and exploring Eagle Crater, the rover recorded a look-back view before departing the scene. Opportunity remains active more than 13 years later. HiRISE, the most powerful telescope ever sent to Mars, is operated by the University of Arizona, Tucson, and was built by Ball Aerospace & Technologies Corp. of Boulder, Colorado. NASA’s Jet Propulsion Laboratory, a division of Caltech in Pasadena, California, manages the MRO Project and Mars Exploration Rover Project for NASA’s Science Mission Directorate, Washington. Lockheed Martin Space Systems, Denver, built the orbiter and collaborates with JPL to operate it. JPL built the rover.